(Yonkers, NY) – Empire City Casino, in partnership with the New York Rangers, announced the final New York Rangers viewing party of the season on Thursday April 5, at 6:30 p.m., hosted by former New York Rangers legend Pete Stemkowski. Stemkowski will mingle with fans, sign autographs and cheer the Rangers on as the team buses over to Brooklyn to take on the New York Islanders. Stemkowski was a Rangers hero during the 1971 Stanley Cup Playoffs, scoring overtime goals in two of the seven semifinal games. Joining Stemkowski for the festivities will be the Rangers Blue Crew, who will put fans to the test with Rangers trivia and offer an array of signed memorabilia and Rangers swag as giveaways during each intermission. The viewing party will be held inside Dan Rooney’s Sports Pub and is FREE to attend. The festivities begin 30 minutes before the puck drops. Hungry fans can enjoy $5 specials, including Budweiser, wings and fried raviolis. Fans coming from NYC or New Jersey can also hop on a free Rangers shuttle bus, which departs Madison Square Garden (outside Café 31, 220 W. 31st St. between Seventh and Eighth Ave) at 5:15 p.m. on April 5th, arriving at the casino around 6:00 p.m. 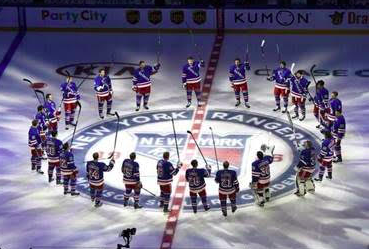 Previous Rangers hosts include New York Rangers Legends Stéphane Matteau, Mike Richter, Steve Vickers and Nick Fotiu.